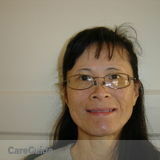 Hi my name is Eva and I am offering my services as a private non-medical caregiver/companion for seniors. I would like to share with you a little about myself. I have a caregiver's heart to help patients live a life of dignity while being cared for. My first patient was my Dad. It was an honor to care for him during the last years of his life. I did everything for him, providing companionship, prepared his meals, kept up with his medication schedule and assisted him with incontinence support. Prior to helping my dad, I was involved in a local convalescent ministry. I spent time with the seniors over 8 years. They shared their thoughts and stories with me and I enjoyed keeping them company. I have experience helping seniors in the areas of companionship, light meal preparation, light housekeeping, dressing, incontinence care, medication reminders, laundry, bathing, exercise, and doctor's appointments. I've also worked with clients that have Dementia, Alzheimer's, and risk of falling. I'm a patient person and have excellent communication with my clients and their family members. I am bilingual in English and Chinese. My fees are between $12/hr - $15/hr. I would prefer to work with female clients. 1 client per family only. I am seeking part-time work and I am available weekdays Monday and Tuesday during daytime hours, between 8am - 4pm. My schedule now are: Wednesday - 10am -1pm and Thursday 6:30am - 11:30am. I am able to travel to the following areas in the South Bay: Harbor City, Lomita, Torrance, Carson, Gardena, Lawndale, Hawthorne, Redondo Beach, San Pedro, Wilmington, Hermosa Beach, and the furthest city: Manhattan Beach. I would love to talk with you further about how I can provide the help you need for your loved one. I can be reached --... or by email [email protected] for details.